First things first, it's not a typo, it does say Orange Marmalade and Gin. Really. 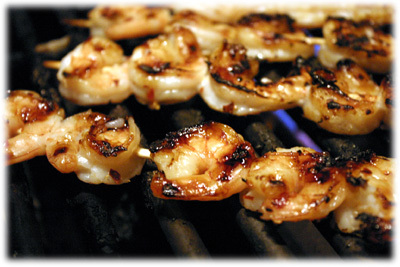 This simple combination is what makes this a unique, easy grilled shrimp recipe. So what defines easy? How about 4 simple ingredients, shrimp, gin, marmalade and crushed red pepper flakes. The gin has a natural juniper flavor that really compliments the sweet orange zest of the marmalade. Toss in some crushed red pepper flakes and this funny marinated shrimp concoction has some pretty good zip to it. And here's an added bonus, one shot of gin for the shrimp, and one for the cook! How's that for a fun filled marinade? Note: for best results let marinate at least 60 minutes. 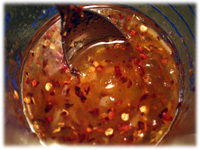 In a small glass bowl combine the marinade ingredients and mix well. The Gin thins out the thick orange marmalade so you'll get the perfect consistency for basting on the shrimp. 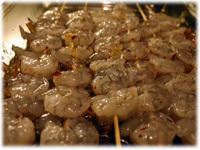 Thread 5 - 6 shrimp on the bamboo skewers and place them in a shallow glass dish. 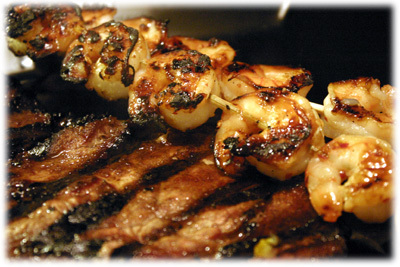 Pour the marinade over the kebabs and rotate them several times to ensure they're evenly coated. Cover with plastic warp and refrigerate at least an hour. Clean and oil the grates of the BBQ and preheat to 575F - 600F. When the grill reaches this temperature place the kebabs on the grates and close the lid. After 3 - 4 minutes, lift the lid and with your BBQ tongs wiggle the skewers to release them from the grates. They should be turning opaque and browning up with nice grill marks on the bottom. Flip them over and close the lid. After another 3 - 4 minutes lift the lid. The shrimp should be cooked by now and a nice sticky orange gold color. It's very important to remember not to overcook them or they'll get tough and dry out. Remove them from the grill and they'll continue to cook slightly as they rest. 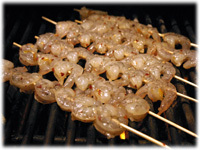 These grilled shrimp are great with a nice thick juicy grilling steak shown below or a tangy citrus flavored lemon chicken recipe.